We pray for Joseph Frawley, Derryindane who died on Sunday, 15 November, 2015. Joseph will repose at St Mary’s Church, Cranny on Tuesday evening from 5pm with prayers for the dead at 7pm. His funeral Mass will be celebrated on Wednesday at 12 noon followed by burial in Kilmurry McMahon cemetery. We pray that the Lord will take Joseph to himself and console his wife Mary, his children Martina, Gerry, Bridget, Patrick and Noel, his daughter-in-law Aisling, his son-in-law Enda his sister Mary, his brother John-Michael and his 11 grandchildren. Joseph’s moths mind Mass will be celebrated in St Mary’s Church, Cranny on 18 December at 7pm. Pray for Thomas O’Brien, Erribul, who died on 7 November, 2015. Tom will repose at t. Benedict’s Church, Coolmeen on Sunday from 6.00pm to 8.00pm with prayers for the dead at 8.00pm. The funeral Mass will celebrated mass on Monday at 11.00am followed by burial in Kildysart Cemetery. We pray that the Lord will take Tom to Himself and console Mary, Martin and all who formed part of his circle of love and care. Tom’s month’s Mass will be celebrated in St Benedict’s Church, Coolmeen on Friday, 11 December at 7pm. Pray for Bridget O’Brien (née Hannon) Ballyartney, Labasheeda who died on 5 October, 2015. May the Lord grant Bridget eternal rest and console all who mourn her. You are asked to remember in prayer Maureen Kelly (nee O’Halloran) late of New Jersey, USA and Moyralla who died recently. Mass will be offered for Maureen in St Mary’s Church, Cranny on Saturday, 17 October 2015. You are asked to remember in your prayer James O’Donnell, Erribul who died on 2 September 2015. Jimmy will repose at St Benedict’s Church, Coolmeen from 6pm to 8pm on Saturday. His funeral Mass will be celebrated on Sunday at 12noon followed by burial in Kilfidane cemetery. May the Lord grant Jimmy eternal rest and console his daughters Anne Marie & Yvonne and son Shay, his sisters Chrissie, Patsy, Anne and grandchildren, all the members of his family and all who mourn him. On Sunday 6 September due to the funeral Mass at 12noon the usual 9.45am Mass in cancelled. Jimmy’s month’s mind Mass will be celebrated in St Benedict’s Church, Coolmeen on Sunday 4 October at 9.45am. We pray for May Kelly (nee O’Neill) Clonkett who died recently in the USA. We pray that the Lord will take May to himself and comfort all who mourn her. You are asked to remember in your prayer Michael Murphy, husband of the late Phil, Clondrina who died on 27 August 2015. Michael will repose at St Benedict’s Church, Coolmeen from 6pm to 8pm on Friday. The funeral Mass will be celebrated on Saturday at 12noon followed by burial in Cranny cemetery. May the Lord grant Michael eternal rest and console his family, Moira, Des, Michael and John and all who knew and loved him. The months mind Mass for Michael will be celebrated in St Benedict’s Church, Coolmeen on Friday 25 September at 8pm. You are asked to remember in your prayer Len Chalkright who died on 30 July in England.We pray that the Lord may take Len to himself and console his daughter Susan King and all who formed part of his circle of love and care. Mass will be offered for Len in St Mary’s Church, Cranny on Friday 28 August at 8pm..
You are asked to remember in your prayer Anne O’Brien, Erribul and late Kinawley, Co. Fermanagh who died on 14 July, 2015. Anne will repose at her son Martin’s residence on Wednesday evening from 5pm to 8pm. Her remains will be removed on Thursday at 11.30am to St Benedict’s Church, Coolmeen for funeral Mass at 12 noon followed by burial in Kildysart cemetery. May the Lord grant Anne eternal rest and console her husband Tom, her son Martin, her daughter Mary and all who knew and loved her. The months mind Mass for Anne will be celebrated in St Michael’s Church, Kildysart on Sunday 23 August at 11am. You are asked to remember in your prayer Cyril Brogan, Derryguihy who died on 13 July 2015. Cyril will repose in St Benedict’s Church, Coolmeen from 6pm to 8pm on Tuesday. The funeral Mass will be celebrated on Wednesday at 11am followed by burial in Kilmurry-McMahon cemetery. May the Lord grant Cyril eternal rest and console his sisters and brothers Martin, Michael, James, Maureen, Cathleen, Margaret, Philomena, and Dolores and all who knew and loved him. You are asked to remember in your prayer Michael (Sonny) Kelly, Carrowreagh East who died on 4 July 2015. Sonny will repose in St Mary’s Church, Cranny from 5pm to 7pm on Sunday. The funeral Mass will be celebrated on Monday at 1pm followed by burial in Cranny cemetery. We pray that the lord will grant sonny eternal rest and console his brother Francis, sisters Mary, Breda and Nellie, his nephews & nieces and all who knew and loved him. The month’s mind Mass for Sonny will be offered in St Mary’s Church, Cranny on Saturday 8 August at 8pm. 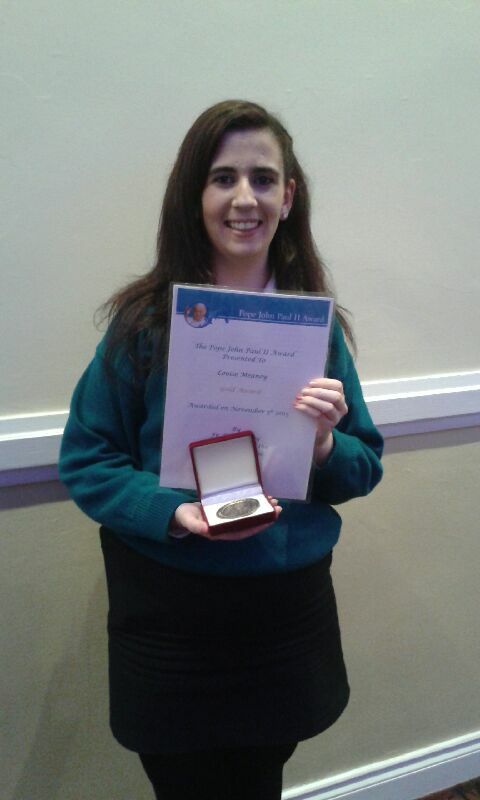 We congratulate Louise Meaney, Newbridge who recently awarded a Pope John Paul II award by the diocese of Killaloe on 5 November 2015. Over a hundred young people from across the diocese received the award in 2015. Louise was granted the award in recognition of her work with the Play and Pray group in Coolmeen-Cranny parish and her involvement with the senior citizens Christmas party and other community and parish events.